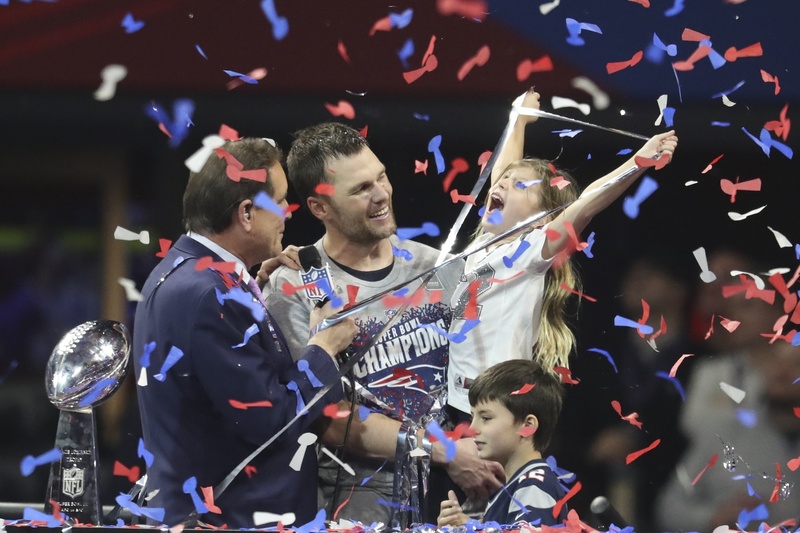 Tom Brady celebrates his sixth Super Bowl title. Brady and the Patriots defeated the Los Angeles Rams 13-3. Photo courtesy of Kevin Jairaj/USA Today. It took 98 days for Boston’s championship drought to end. As a Patriots fan, I was obligated to sit through the whole game, which lasted three hours and 32 minutes, just to have the outcome of the game be exactly what every Boston fan expected. Don’t congratulate Boston fans. Instead, show them sympathy since it is so hard to always be on top. How can you feel bad for a city that has won a championship in all four major sports? Easy. Imagine the absurdly long lines at Dunkin’ before driving through the maze of what is Boston’s downtown to watch yet another parade. The early 11 a.m. start is just the beginning of the treacherous day. What’s even worse is this is the 12th time Boston has had to watch those weird land boats we call Duck Boats parade down the historic streets. Who would want to stand around at a city-wide party anyways? Sounds miserable if you ask any Boston fan. All of Boston held its breath when the player we call the G.O.A.T. was forced to throw a pass over 10 yards to a receiver who was actually covered. Can you believe we have a 6-foot-6, 225-pound beast of a man that we have to actually trust when the only two phrases he can say are “Gronk” and “Tide pods”? When the Patriots finished their touchdown drive, Brady and Belichick brought out their matching walkers to prove to people just how old they truly are. At least for football games, we only have to endure four quarters instead of a whole series of games. In the 2018 World Series, we had to sit through five whole games. Game 3 lasted 18 innings. The amount of stress this puts on one person is like nothing else. As a fan, it is painful to watch the great David Ortiz light up the city of Boston after heartbreak by dropping the most influential F-bomb. After Sunday’s exhilarating shootout between the LA Rams and Patriots, it’s tough to imagine us Boston fans ever surviving while watching another game. Don’t even think about bringing up Super Bowl XLIX to a Patriots fan, their heart hasn’t fully recovered. Leave it to Malcom Butler to show the world that Boston fans can’t be sure of anything. He wanted to be selfish and make history by picking off Seattle quarterback Russell Wilson on the one-yard line to seal the deal. You can cautiously bring up our comeback win against the Falcons but don’t be surprised if they start to shake, it is just a common symptom. In 2008, Boston fans had one of the hardest years in a while. For 22 years, the city waited and sulked until the Celtics were able to raise the banner after beating superstar Kobe Bryant and yet another Los Angeles team. That win was hard on every Celtics fan because they had to dust off that old Larry Bird jersey tucked away in the back of their closet. Not only that, but no one looks good in kelly green — it’s impossible to match. To top it all off, we won the coveted Stanley Cup. For those of you who lost count, that is all four major sports winning the championship title in their respective sport. Not to get that confused with the now six titles the Patriots have won. The Bruins made 2011 their year after they beat the Vancouver Canucks in a full seven-game series. The pain every Boston fan felt when they won Game 3 by a nail-biting score of 8-1 was hard to stomach. Who could forget that close Game 7, where we scored four and they scored a whopping zero? But don’t let all this winning fool you. It is very hard to be a Boston fan. With all this winning, it’s hard to imagine even the idea of losing. When Boston loses, the world cheers. The lack of appreciation shown to Boston sports dynasties is something we think about every day. Since the feat is just an average occurrence, most people overlook how amazing it is. So when your team loses, don’t feel mad or upset, feel bad for the Boston fans that had to endure the long nights, hatred, the overuse of the word “MVP” and standing for their 12th parade.